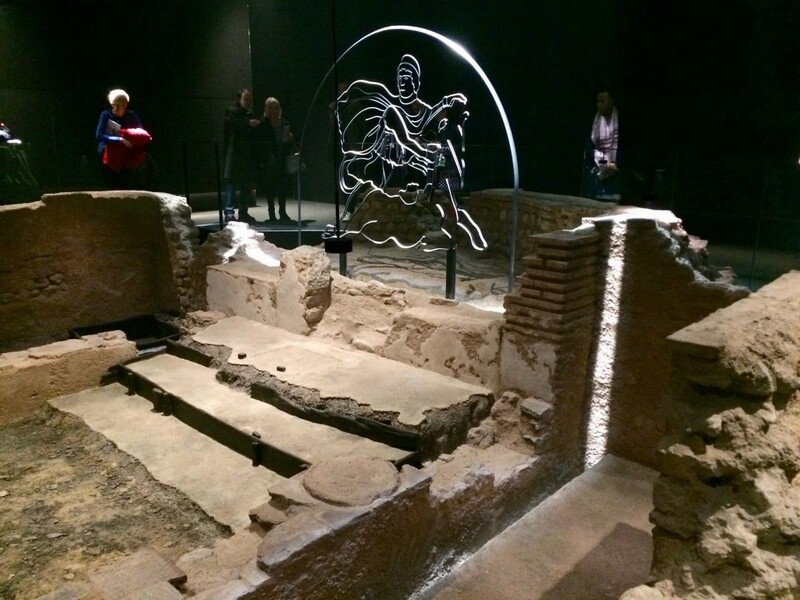 Most Londoners are aware of London's Roman history, and that most of the Roman archaeological sites are buried underneath the City of London, London's historic financial district. However, not many knew about a Roman temple ruin that was rediscovered by chance on a bomb site in 1952-54 during the construction of the Bucklersbury House. 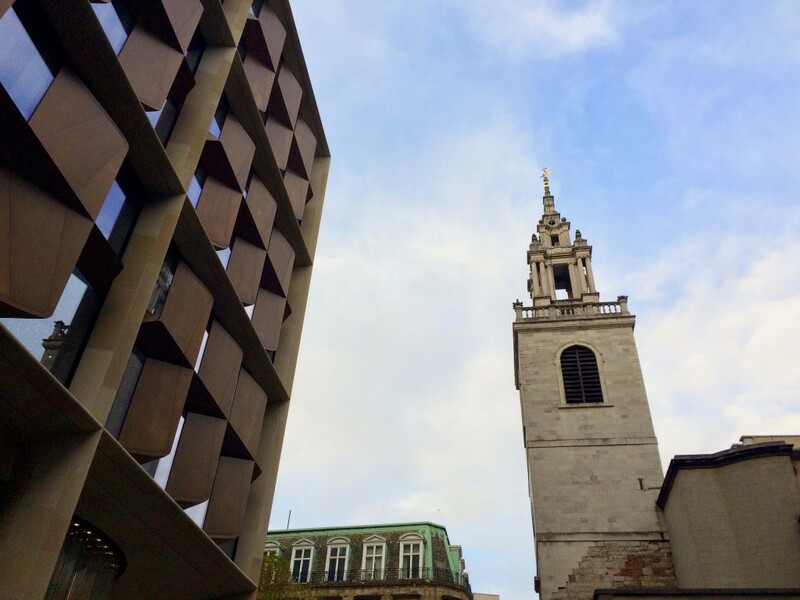 Later, the temple was dismantled and reconstructed – inaccurately – 100 metres from its original site to the car park roof at Temple Court ( I wonder how many Londoners had visited this site?). 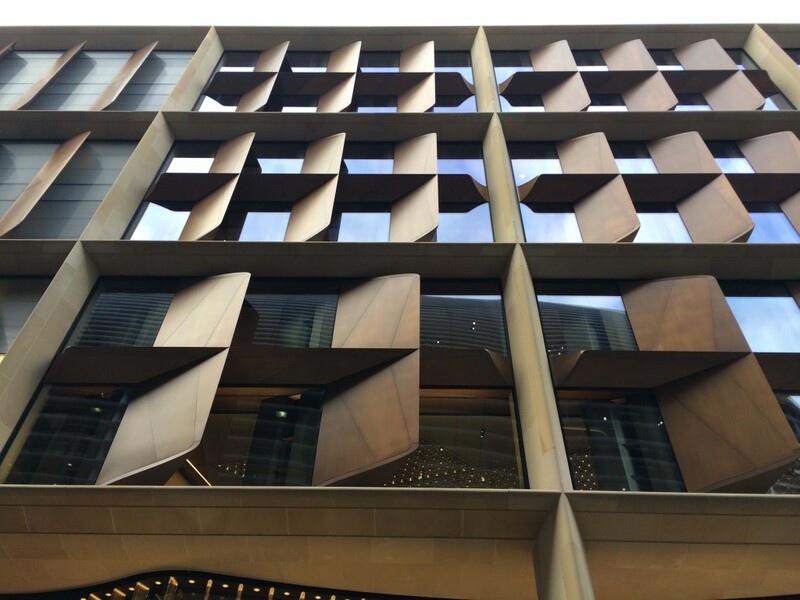 After the demolition of the Bucklersbury House, the site was purchased by Bloomberg in 2010, and the company decided to restore The Temple of Mithras to its original site as part of their new European headquarters designed by Foster + Partners. 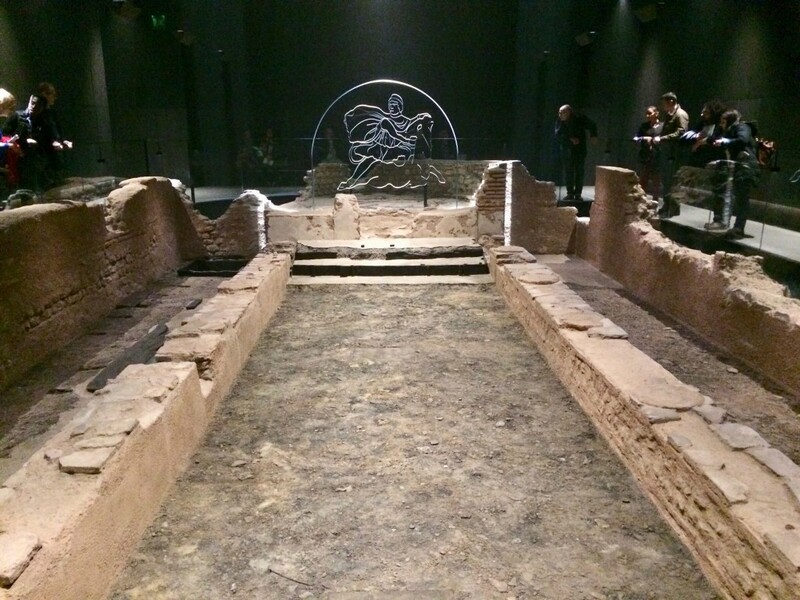 Originally constructed around AD 240, the Temple of Mithras was finally restored close to its original position and level, which is seven metres below modern street level and by the – now subterranean – River Walbrook. 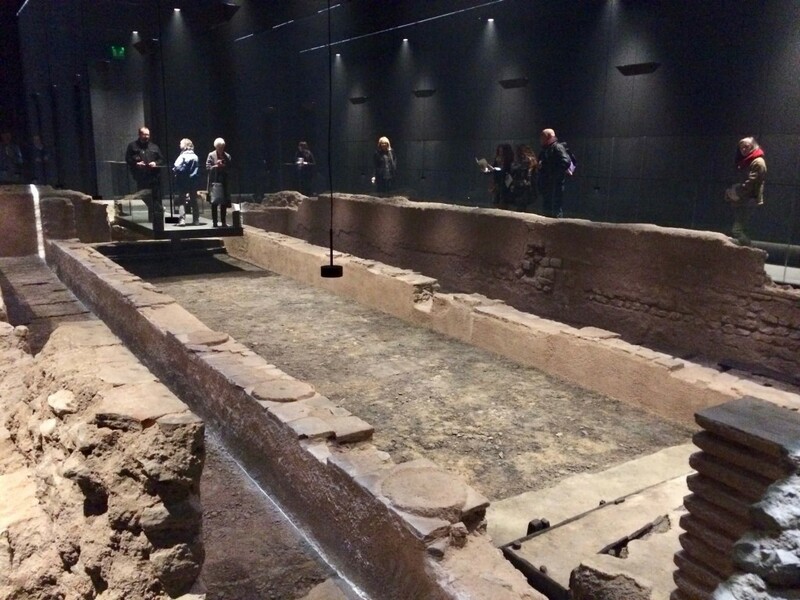 Aside from the restoration work, Museum of London Archaeology also led a team of over 50 archaeologists and excavated the site between 2010-14. 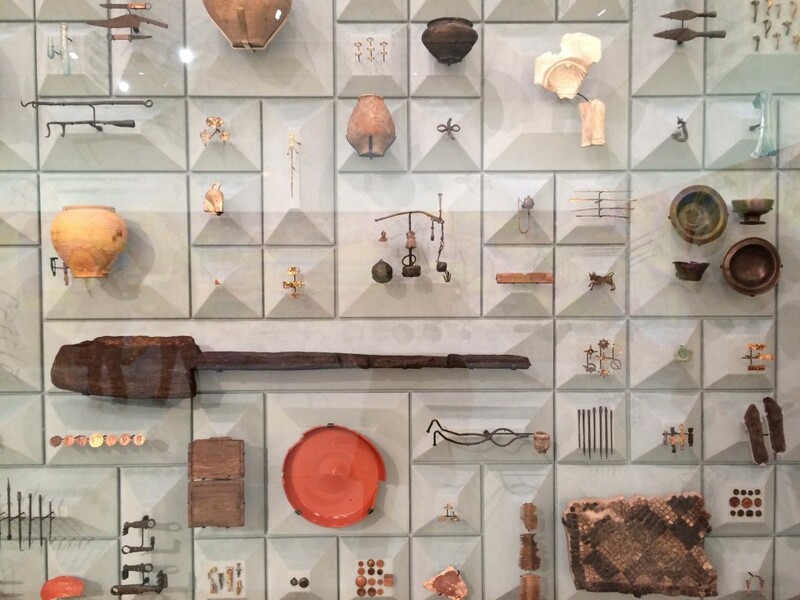 They recovered more than 14,000 artifacts, including a large assembly of tools. 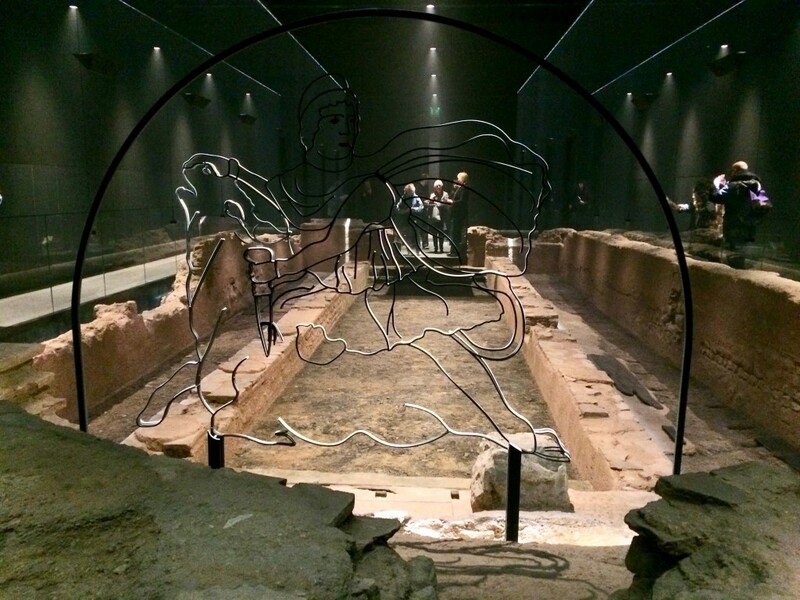 In early November, the free cultural hub opened its doors to the public, and visitors could book a time slot to visit via the London Mithraeum website. 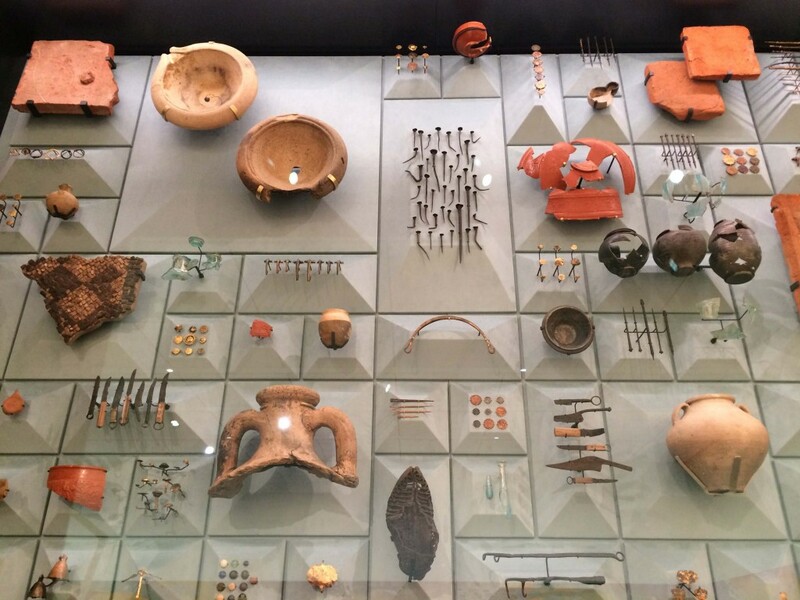 On the ground level, there is an art gallery space showcasing contemporary art work, and a vast array of Roman artifacts excavated from the site. Apart from on-site guides, visitors are also given ipads explaining the functions of these items. Then we were led down the stairs to a waiting area where we could learn more about the temple and its origin. When we were finally allowed to descend down into the pitch black and smoky temple space, there was a sense anticipation among the visitors. Slowly, the room started to light up while a soundscape of chanting, bells and horns was added to enhance the multi-sensory experience. 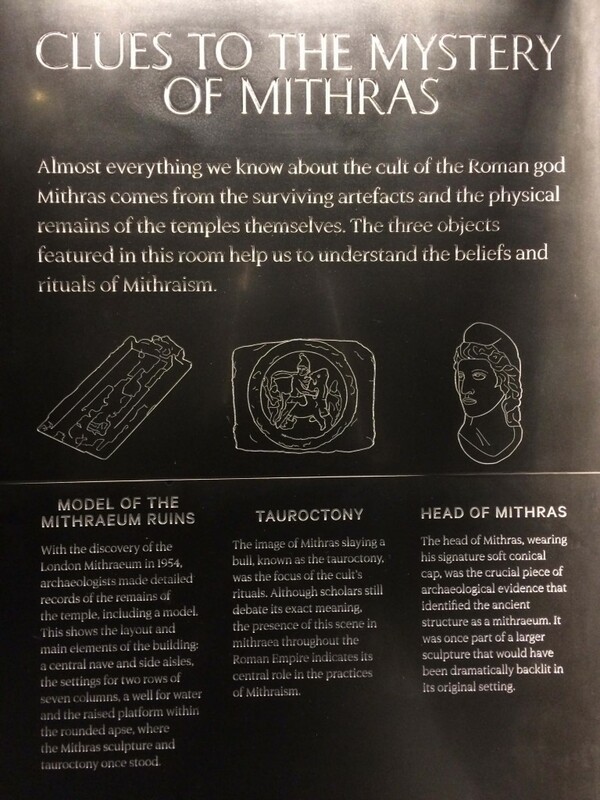 The Cult of Mithras was a mystery religion centered around the the Indo-Iranian deity Mithras, which was practised in the Roman Empire from about the 1st to the 4th century CE. The temples of Mithras were always an underground cave, featuring a relief of Mithras killing the bull. It's all-male membership was drawn from soldiers, merchants and freeman who travelled widely through the Roman Empire. It is believed members gathered in windowless temples to drink and perform rituals and animal sacrifices naked in the dark, illuminated by torchlight. I wonder if this is what the Scientologists do when they get together? I think Bloomberg has done a remarkable job of restoring the temple and in creating a mysterious atmosphere and immersive experience once inside the temple space. Best of all, it is free and visitors (both locals and tourists) can learn a great deal about the history of Roman London. 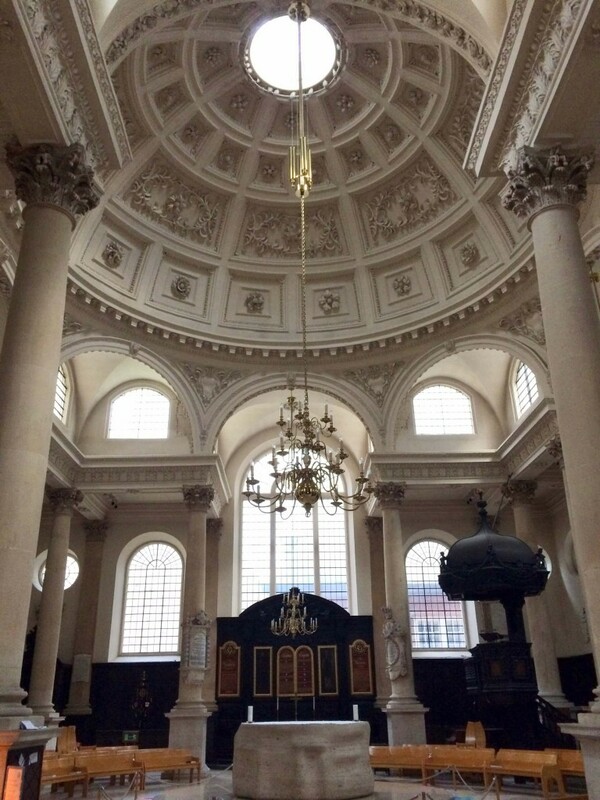 After the visit of the temple, I walked past the nearby St Stephen Walbrook and decided to go inside to take a look. 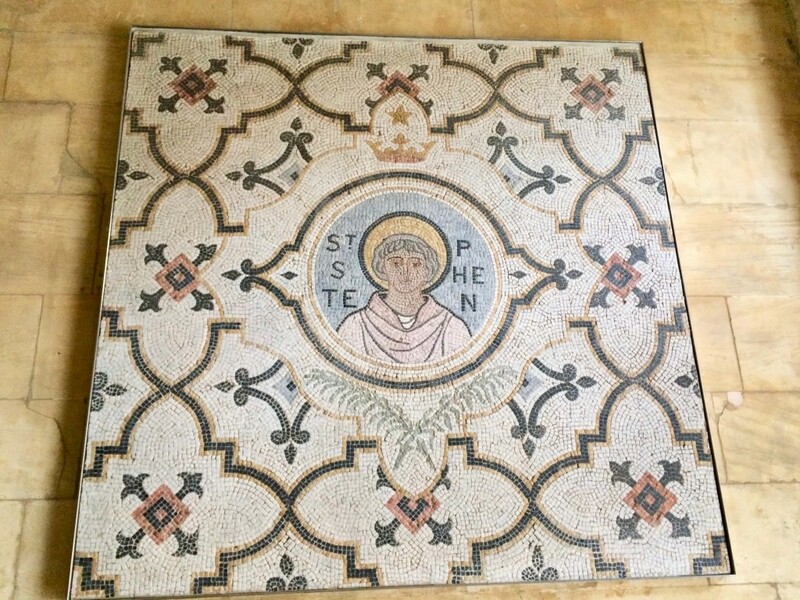 Interestingly, the church's history is intertwined with the nearby temple of Mithras. 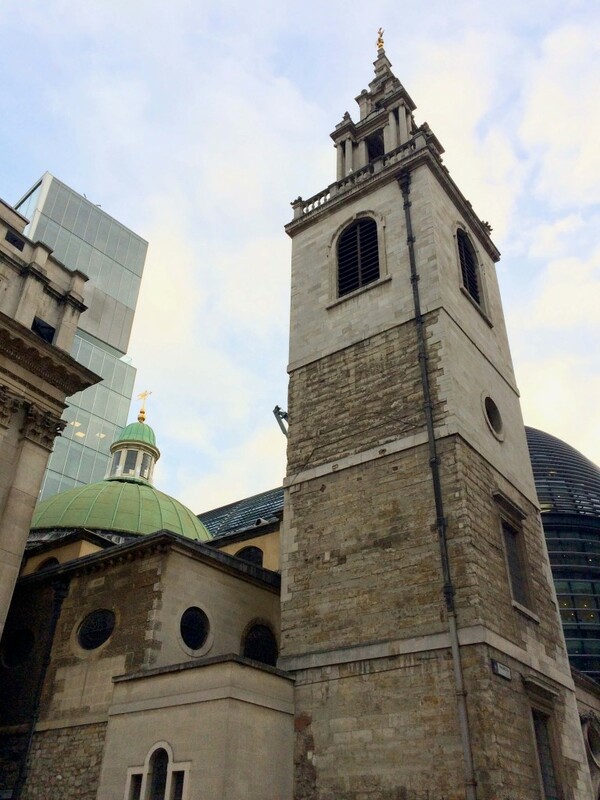 The original church of St Stephen was built on the Mithraic foundations on the west side of River Walbrook between 700 to 980 A.D, but was moved to its present site, on the east side of the river (by then, it was no longer a river) in 15th century. In 1666, the church was burnt down at the Great fire of London. 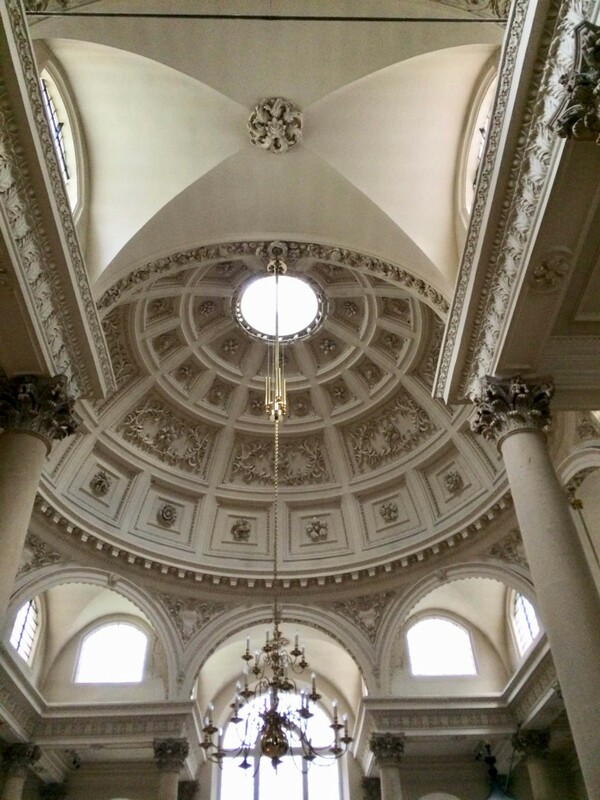 After the fire, the English anatomist, astronomer, geometer, mathematician, physicist and architect Sir Christopher Wren was commissioned to design and rebuild 52 churches within the city including St Stephen Walbrook and St Paul’s Cathedral. 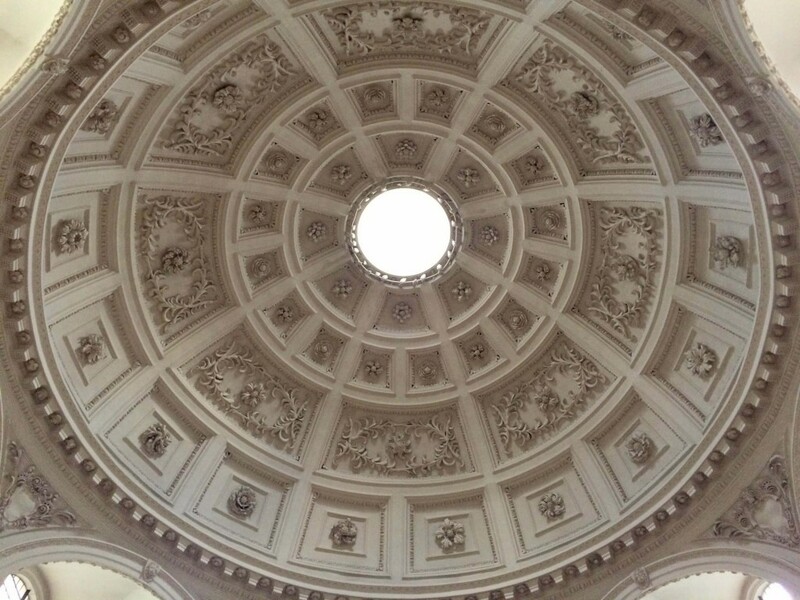 The constructions of the church started in 1672 and completed in 1679; this was his prototype for the dome of St Paul’s Cathedral, and the first classical dome to be built in England at the time. 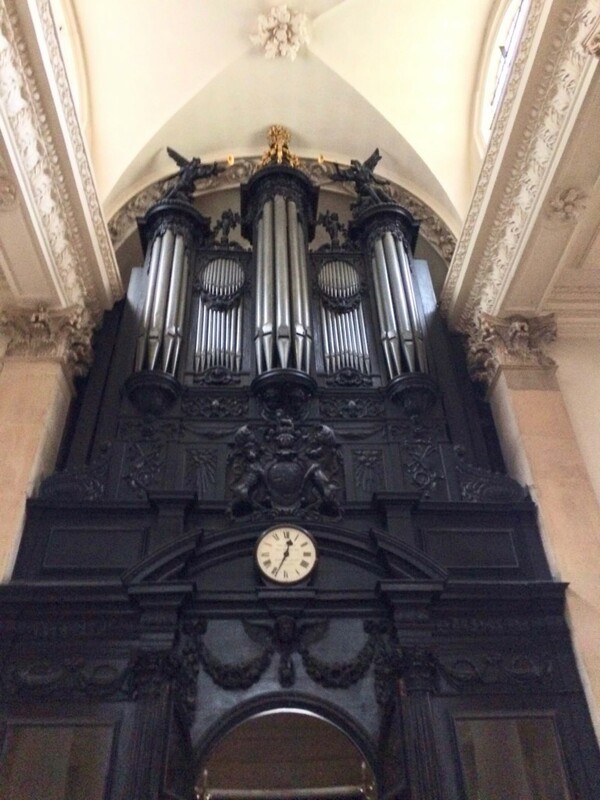 I am surprised that I have never visited this Grade I listed church before – it is a stunning masterpiece. 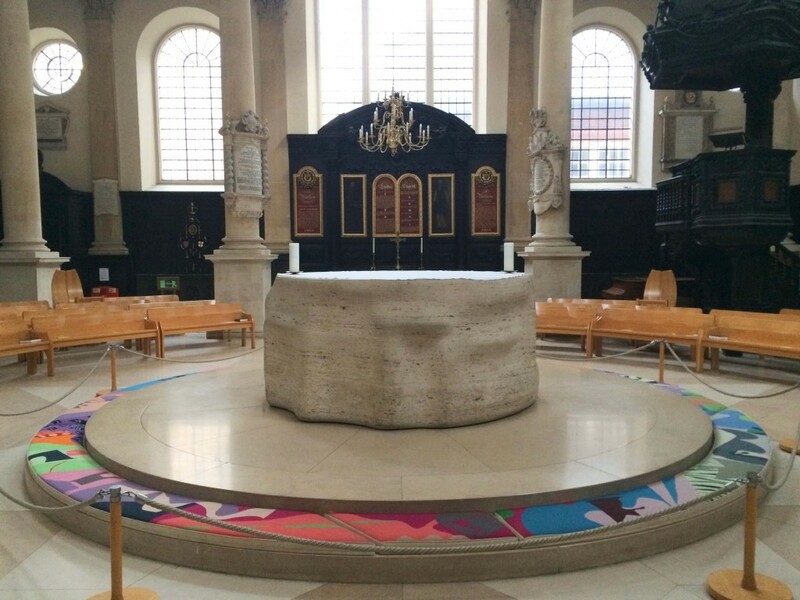 Unexpectedly in the middle of the historic church stands an 8-ton white polished stone altar commissioned from the artist/sculptor Henry Moore by churchwarden and property developer Lord Peter Palumbo in 1972 during the restoration of the church after it was badly damage during The Blitz in 1941. The controversial altar was considered unsuitable until it was approved by The Court of Ecclesiastical Causes Reserved of the Church of England. 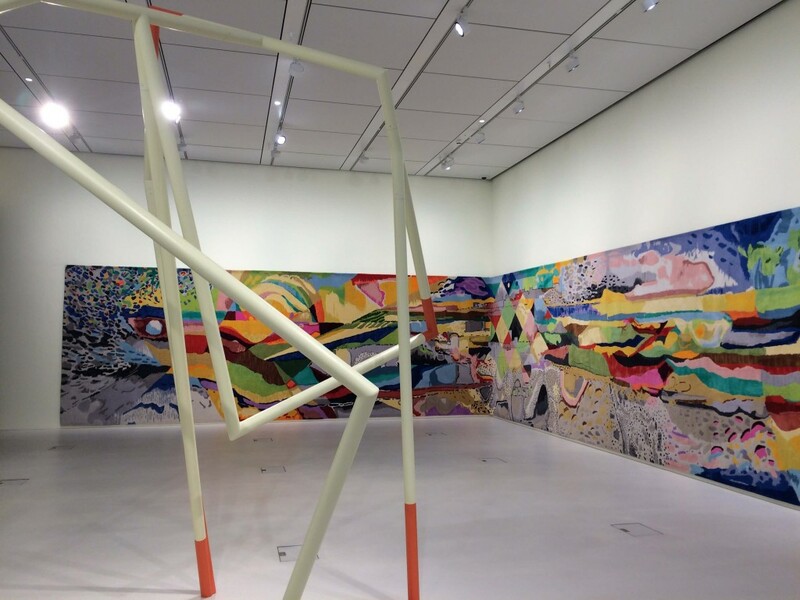 Later in 1993, a circle of brightly coloured kneelers designed by abstract painter Patrick Heron was added around the altar. The kneelers were made by Tapisserie, a shop in Chelsea that specialises in fine hand-painted needlework. Personally, I think the minimalist altar blends well with the surroundings, but I am less convinced about the kneelers. Nonetheless, it's courageous to challenge the conventions, and I am all for breaking the dogmatic rules set by religious authorities. There are days when I feel fed up with London, but when I discover something new or unusual in the city, it would always bring me joy, excitement and fascination. Sometimes we all have to be more like a tourist in order to see and appreciate the city we live in. 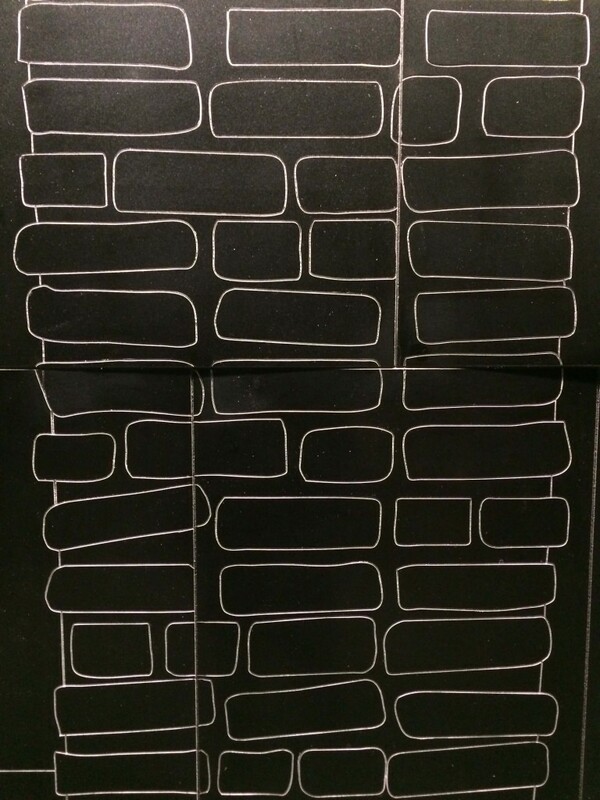 Now I can't wait for my next discovery!